Big Picture People’s Big Move! 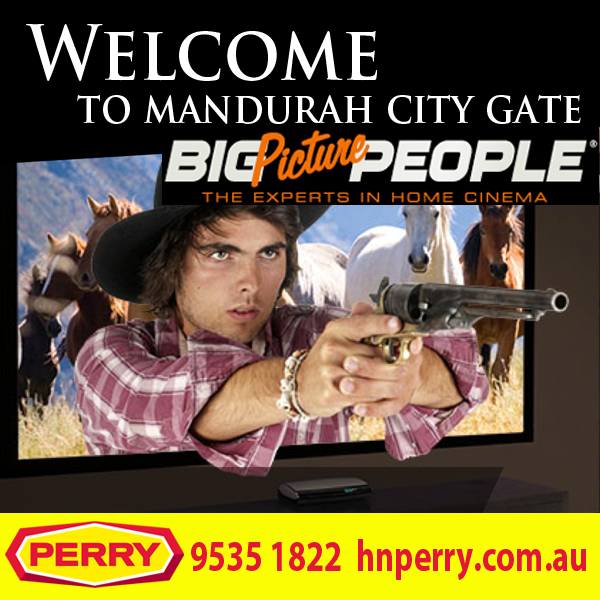 H&N Perry would like to welcome Big Picture People to their new premises at Shop 12, 8 Magenta Terrace Mandurah. Previously trading as West Coast Hifi, the home cinema and entertainment specialists will now be operating under their new name in a quality showroom located within the high profile Mandurah City Gate Complex. Big Picture People have been operating collectively since 2003 and have retail outlets all over Australia, however the new Mandurah branch is the only store in Western Australia at present. This means that Mandurah locals will have the benefit of easy access to the highest quality home theatre systems available. Unlike other entertainment retail outlets that just have shelves of boxes, Big Picture People have cleverly laid out their store as ‘real life’ rooms for you to explore. This makes visiting the store and experience in itself! Mandurah City Gate is ideally located at the crux of the Mandurah Bypass Road and Mandurah Terrace division. This prime position offers businesses within a strong flow of potential customers passing its doors everyday. Other high profile retailers within the complex include Clark Rubber, Anytime Fitness, Poolmart, Aussie Outdoor, Spice Furniture, Salvos Stores and Inspirations Paint & Colour. Together this tight cluster of successful retailers bring many shoppers all to the one location. Currently H&N Perry still have two units within the complex available for lease. If you want your business to prosper in this booming location, call Brian Matthews or Jan Wiley at H&N Perry on 9535 1822.